Not a difficult choice this one as I featured this one just a few months ago. Best Value Military – (1st Choice) – and only choice actually and I’ve looked at an awful lot of ’em . 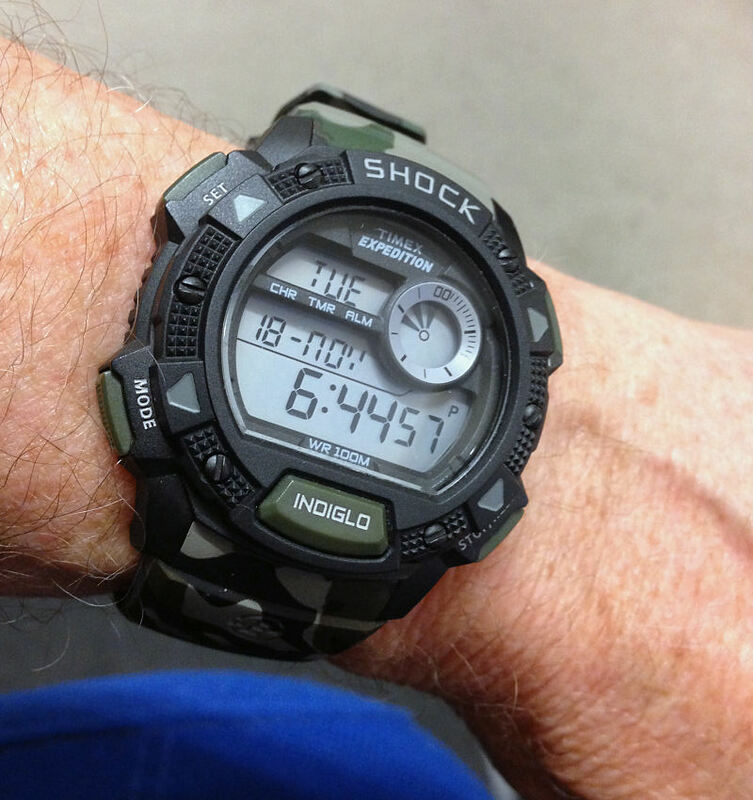 . .
Has to be the Timex Expedition T49976 shock model in camouflage garb which manages two things – it looks good and it is good. With it’s neat black/green resin shock case this is a pretty good example of a “military style” watch that seems to me to be about as good as it gets – period! Note the supplied strap is in resin/rubber camouflage with a non reflective buckle and standard lug fixing. The digital display is also as good as you can get, great contrast and no issues seeing the digits and subsequently has excellent day and night vision, which puts many other brands to shame. It also features one of the better incarnations of Timex’s Indiglo and provides superb night vision. Amongst it’s functions we have Dual Time, Chronograph, 5 Alarms, Timer and so on and it is very easy and intuitive to use. Also the countdown Timer has a graphic counter which is very useful. The dial also shows all your basic data at the same glance – that is – Day, Date, Month Time and running Seconds. CI particularly like this Shock case which on the upper bezel above the glass is made from a softer almost rubbery compound than the main case, which gives really good protection. This model has a resin light weight case and it’s also a sensible size at just 45mm diameter and if you include the textured pushers barely 47mm. Importantly the lug to lug measurement is commendably short at 48mm, so this watch will fit the smaller wrist and not look like macho man. And at 14mm depth the overall look of the watch is unobtrusive and has the bonus of no shiny or reflective parts. The watch is so light weight you really forget it’s there. Good Water Resistance at 100m and a big CR2016 battery (available almost anywhere) plus that front mounted easy to use and find Indiglo dial light pusher, this is a very practical watch. Note the case is quite sophisticated in the the base body of the case is made from a hard compound resin, but cleverly, the upper part with the bezel is made from a softer compound, which is almost rubbery in texture. This gives really good protection of the hardened mineral crystal glass and as it also protrudes above the glass assists in the protection process. Most military folks will tell you (and I’m an ex) that a straightforward 3 hand analog that’s well made, accurate and luminous is in practical terms all you really need. However times move on and when it comes to digital models of course there are no standards and the fact that most digital modules have lots of functionality, this is fine, BUT are they easy to use without an instruction booklet with you at all times? Also many so called military watches have this idiotic “stealth” description which usually means you can’t see the dial even in a half decent light – so just pure gimmickry! Well I like this model as when you look at it from any point of view and I include a military aspect. It has most everything you need, with excellent and useful functions and with good control (pushers) positions that are easy to find with the fingers (unlike some Casio’s). It’s simple, simple ease of use (no instruction booklet in your pocket just in case), good battery life and with just 4 screws on that stainless steel back plate that battery is super easy to change too – add a bit of grease on that seal (yes there is one) and you’re in business again and it is also one tough watch. And it’s brilliant at night. It also lasts – as I’ve worn this through in all sorts of situations and it still looks great. In fact I could put this forward as best equal as a “Daily Beater” as it’s one of those models that can do most anything, anywhere and anytime. And it is accurate enough that the last time I changed from Summer Time, I just moved it back 1 hour with no actual time adjustment. So I have not changed the minutes time setting for about a year and I note it’s just 19 seconds fast against my computer as I write this. Price wise maybe just under £50 in the UK – now I call that value!